Gary Hamilton admitted he was ‘gutted’ after a last-gasp equaliser prevented his Glenavon side from closing the gap on second placed Ballymena United. 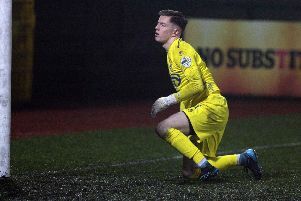 The Lurgan Blues looked to move withinthree points of the Sky Blues until Ben Doherty struck a 90th minute leveller for Coleraine at Mourneview Park. Speaking afterwards Hamilton said his side would keep fighting for the automatic European spot, but he knows it will be a tough askwith only three games remaining. “I’m gutted for the boys because we knew if we had held on we would have overtook Crusaders,” said. “We have three massive games left and we just have to take it a game at a time. “We know that if we are to have any chance of getting European football from our league position then we have to finish above Ballymena. “To do that we have to win three out of three, and when it comes to the last five games against the top six sides that’s pretty impossible at times. The game was a tale of two penalties as Coleraine missed an early spot kick as Johnny Tuffey saved Jamie McGonigle’s pot kick after Eoin Wearen had bundled him over in the box. The home side were then awarded a penalty of their own just past the hour mark after Stephen Murray went down in the area. But the Bannsiders felt the front man went down to easy under Steven Douglas’s challenge. Sammy Clingan stuck away the penalty, but Hamilton felt his side could have been awarded a nother ahen Josh Daniels was fouled, but Keith Kennedy only gave a free kick. “If the first one wasn’t a penalty the Josh Daniels one cancels it out,” said Hamilton. “I’ll be honest some of my coaching staff didn’t think it was a penalty, I did think it was a penalty, but I stand to be corrected. “I thought the defender gave the referee a decision to make by going to ground because the player was going nowhere. “Stephen is an honest lad, he said he touched him. I don’t think there was a lot in it but I think there was contact. I 100 per cent thought the Josh Daniels one was in the box. Coleraine boss Rodney McAree was disappointed with the penaty decision, but was pleased with a better defensive showing from his side. “After last week we came here today and challenged ourselves to get a clean sheet,” he said. “The penalty kick goes against us. To be fair to Keith he says if he got it wrong he’ll hold his hands up and apologise. “Decisions are there to be made but we don’t seem to be getting too many good ones for us at the moment. “We don’t seem to be getting too much rub of the green, things seem to be going against us a little since the semi-final. “But we just keep plugging away and hopefully that will change and we’ll get our turn at some stage. “I’m happy that we got back into the game after being 1-0 down. “I was pleased with our response because after conceding four goals last week it would have been very easy to throw the towel in. “We looked at our positives last week in terms of going forward. “Defensively we were were very poor last week, defensively we were better today and could have been a bit better going forward.